From the architect. 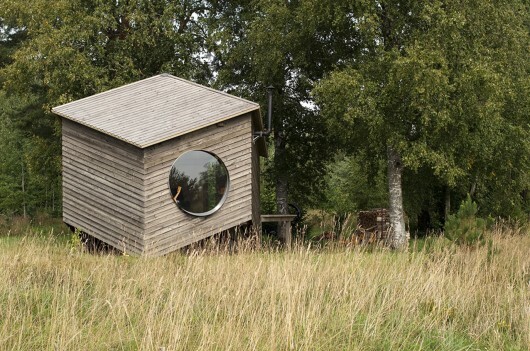 NOA is an easily mountable sustainable living space, adaptable to a variety of landscapes and environments. The advantage is that one can always add a module to extend the housing step by step, with each module, ones “saves” a wall. It is an invention by Jaanus Orgusaar, an Estonian designer-inventor. 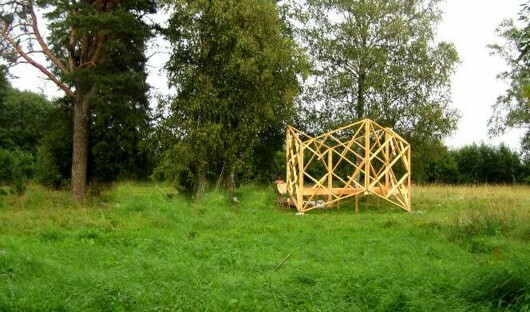 He built the first one for his own family, and plans to add two more modules. One module is 25 sq metres. The small house was brought to life from the need for a practical, sustainable and economical living space which would be easily mountable compiled from identical elements. The base element is a specific rhombus. The base for the structure is the rhombic dodecahedron. The rhombic dodecahedron can be used to tessellate three-dimensional space. 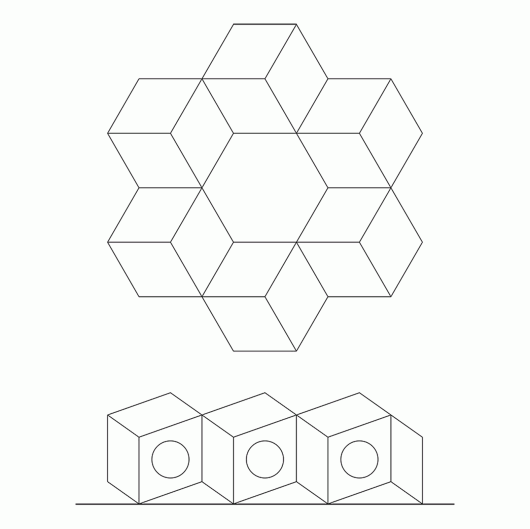 It can be stacked to fill a space much like hexagons fill a plane. Some minerals such as garnet form a rhombic dodecahedral crystal habit. Honeybees use the geometry of rhombic dodecahedra to form honeycomb from a tessellation of cells each of which is a hexagonal prism capped with half a rhombic dodecahedron. The rhombic dodecahedron also appears in the unit cells of diamond and diamondoids. 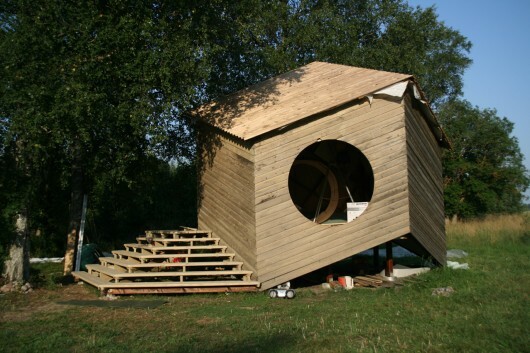 While looking for the perfect structure that would fill the space without void, Jaanus chose this unique structure for it is stable standing on three feet, stiff and because it spreads the tension evenly, and offers a synergy in space apprehension, having almost sacral feeling to its round space. Jaanus is an inventor diving into the very bases of geometry. Many of his creations starting from shoes and fashion, product design and now architecture takes its inspiration from the sacred geometry, the five platonic solids and their inter-relations. The building stands on three feet, not needing a foundation on the ground, therefore also more cold resistant than a usual dwelling. 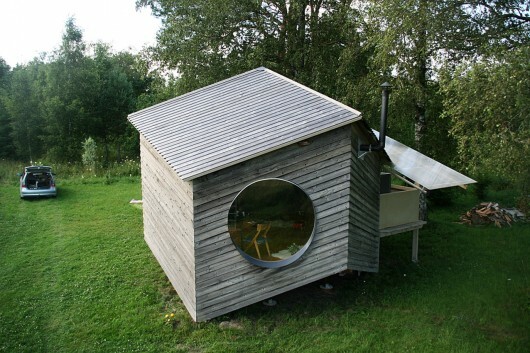 The house lacks acute angles, therefore giving an impression of a round space. 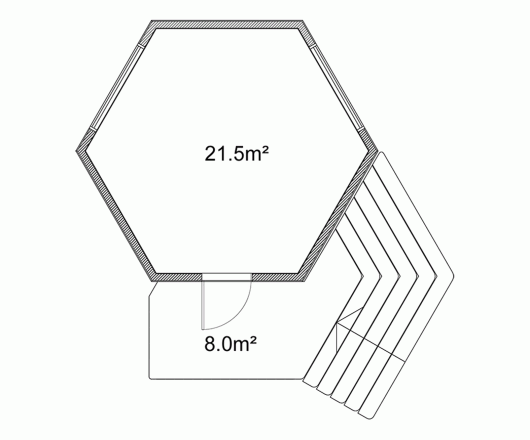 The floor plan of the house is a hexagon, walls and roof compiled of identical rhombuses, therefore it is easy to continue the structure in space by adding the next module. This kind of structure is simple and economical, yet strong, offering a great, almost timeless, sacral space experience. 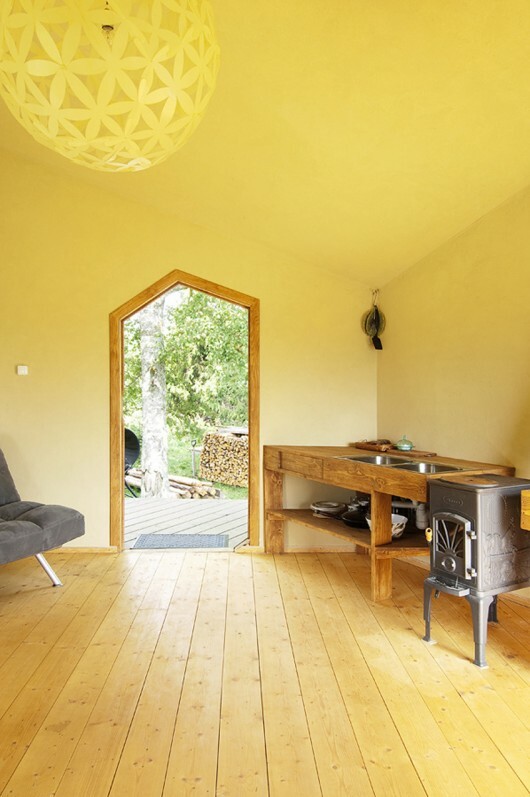 The little house is currently in use as a summer cottage for the designer`s family, the insides continue without interruption to the summer terrace that is used as a dining area,. The house is situated at the brink of o forest in the very vicinity of a 200 year old pine tree and fur tree, therefore guests from the forest, as owls and squirrels are commonplace. 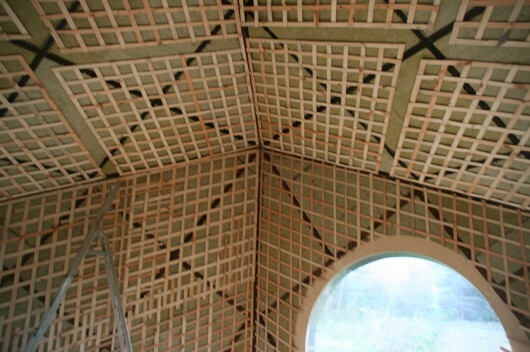 Materials used are all sustainable- wooden construction, floor and outside boarding, even roof- covered with thermo boards. The walls are plastered with limestone paste and painted with cottage cheese paint. The outside wall boards are soaked with iron-oxide to make the house grey fitting into the surrounding nature almost inconspicuously. 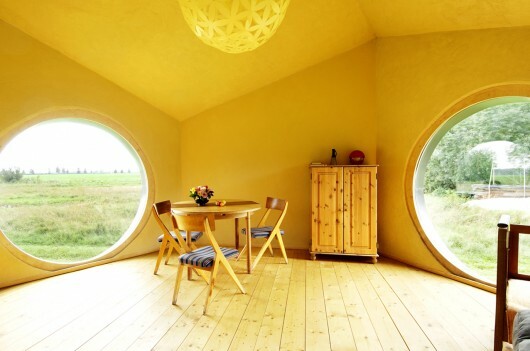 The round windows frame the view to the open space of endless fields. In the dark the windows reflect the space so that it creates an illusion of additional rooms in the dark. Noa widens the concept of space offering a different space experience.